How Reliable is Ultrasound in PKD Diagnosis? PKD is polycystic kidney disease. This is a genetic disease where cysts form on the kidneys, eventually producing loss of effective renal (kidney) function. Cats diagnosed with PKD can live many years, or die quickly. Zhelan Manchzhury turned three years old on 27 January 2013! Happy Birthday, Zhelan! What is PKD in Cats? PKD = polycystic kidney disease. Cats can inherit it, people can inherit it. If a cat's parent has PKD, that cat has a 50% chance of having inherited the gene and later expressing the disease. As a prospective ForestWind Kitten Family Member, it is important for you to know the steps we take to keep our cats and kittens healthy and vibrant. Our Siberians are scanned by Board Certified Specialists every two years for HCM. Even in breeds with identified HCM mutations, regular ultrasonography is necessary to rule out development of HCM. Does Coat Color or Any Trait Predict Allergen Level? Cats produce 7 different allergenic proteins. Scientists label these feline allergens fel d-1, fel d-2, fel d-3, and so on. The cat allergen most people react to is named fel d-1. 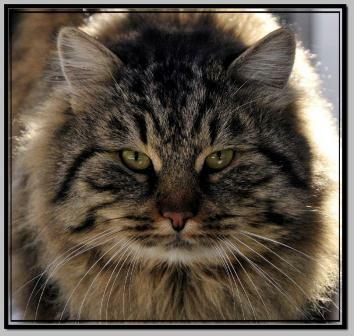 Some Siberian cats produce very little fel d-1, allowing most cat allergic people to live happily with them.